Prized across the country and around the world, cherries and pears are two of Oregon’s top tree fruits. 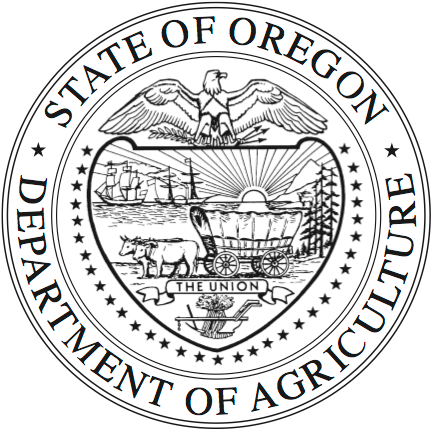 Nationwide, Oregon ranks third in sweet cherry and fresh pear production with 13,150 acres of cherry orchards and 16,200 acres dedicated to pears. Worldwide, the largest producer and processor of sweet cherries is Oregon Cherry Growers, a co-op of around 70 farmers with plants in The Dalles and Oregon’s capital, Salem, where the buses are dubbed “Cherriots.” Oregon is noted as a leader in cherry innovations. Born during Prohibition out of the need to preserve cherries without using alcohol, today’s maraschino cherries come in natural varieties using beets and berries for coloring. Oregon Cherry Growers supplies fresh, maraschino, dried, and frozen sweet cherries and other fruits to customers worldwide. “We pack and process an average of 25,000 to 30,000 tons of cherries annually,” says Tim Ramsey, CEO and president. 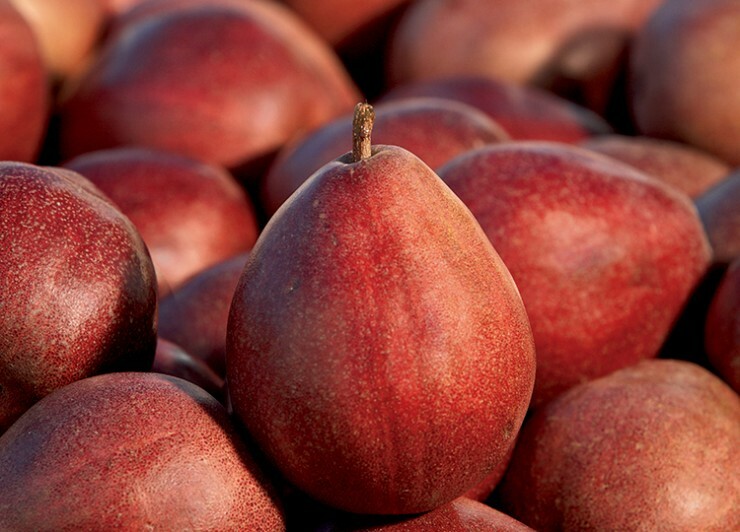 Pears, Oregon’s official state fruit, are available almost year-round. Harvest begins in August and continues through October, with each pear carefully picked by hand to maintain the fruit’s pristine quality. Pears are harvested when the fruit is fully mature, but not yet ripe. Firm when transported in refrigerated conditions, pears ripen to sweet and juicy perfection after they are brought to room temperature. Oregon cherries reach mouth-watering sweetness from June to late August, depending upon variety, weather and elevation. The well-known Bing cherry was developed by Henderson Lewelling in Oregon in 1875 and named after his Chinese assistant. 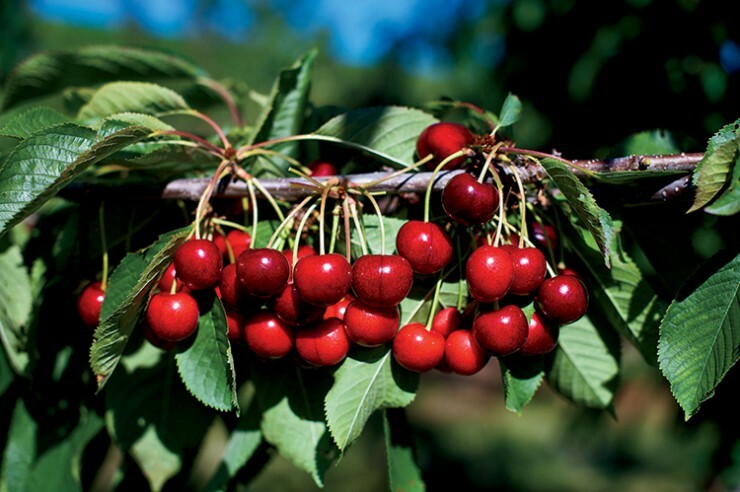 The Chelan and Tieton varieties start cherry season in early June, a bit ahead of the Bing, while Sweetheart and Lapin varieties extend the dark red cherry season into mid-August. The Rainier spans late June through early August. Fresh cherries may be frozen for use year-round. Longer fruit harvests leverage Oregon’s natural advantages: location, clear water, and warm days and cool nights. Brenda Thomas, president of Orchard View Farms near the Columbia River Gorge, says “It’s a drier climate with low humidity, ideal for cherries. And the ground is sloping, which helps us plant trees in locations to avoid frost.” Cherry trees thrive in the state’s best-draining soils. Other trees, like the Comice pear, may flourish in soils with more clay. About 22 miles west on the north flank of Mt. 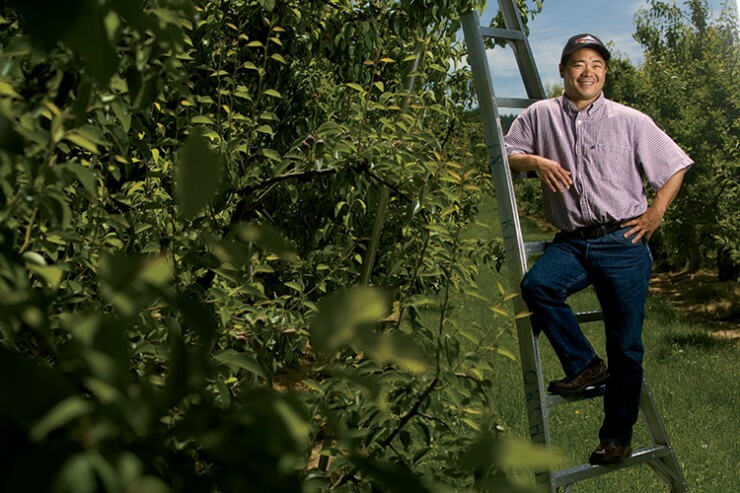 Hood, Randy Kiyokawa says, “Our soil is ideal for growing tree fruit. In the Hood River Valley, our soils are rich and deep.” His grandfather planted the orchards in 1911. Today the family farms 187 acres. Kiyokawa also grows Anjou and more than 25 other pear varieties, both European and Asian. He ships most of his pears to the local co-op, Diamond Fruit Growers, for sorting, packing, cold storage and distribution across the U.S. and around the world. Oregon’s world-renowned pear orchards also thrive 300 miles south in the Rogue River Valley near Medford, where gourmet fruit gift retailer Harry & David originated. Both pears and cherries offer many health benefits. Cherries have anti-inflammatory properties that may help decrease arthritis and gout. They are a good source of potassium, melatonin, antioxidants and have a low glycemic index, with their sugars releasing more slowly and keeping you feeling full longer. Pears are an excellent source of fiber and a good source of vitamin C.
Whether in Oregon’s farmers markets, at hundreds of retailers in the U.S. or in more than 60 countries worldwide, everyone can enjoy the delicious taste and health benefits of Oregon pears, cherries and other tree fruits.